A beautiful sunset on the horizon over the Missouri River. This location is near the confluence with Turkey Creek. Bass Creek flows into the Three Creeks Conservation Area. Located in the heart of the Rock Bridge Memorial State Park, the Rock Bridge was once part of a cave that collapsed into the stream between the bridge and the Devil's Icebox. Three Creeks Conservation Area features beautiful trails, including naturally formed rock steps. Most of the water in this stream is a mixture of ground and surface water is flowing directly out of the surrounding cave system. The streams in Three Creeks Conservation Area are Turkey, Bass, and Bonne Femme creeks. You will also find Hunters Cave located in the Three Creeks area. A lovely view of the Bonne Femme from the river bridge. A handsome box turtle makes his way across the rugged forest terrain. An inviting landscape as you enter the Three Creeks south forest entrance. Fallen trees line the shady fringes of Gans Creek Wild Area. A narrow karst window, located in Three Creeks Conservation Area, is a natural cavity beneath the surface of the earth. Karst windows are formed when sinkholes collapse. Extended boughts of dry weather cause water levels in the Little Bonne Femme Creek to drop, exposing more of the stream banks. A beautiful blue sky hovers over the Missouri River near Easley. A tributary to Gans Creek runs through a valley along the Shooting Star Bluffs hiking trail. Below the Rock Bridge, water rushes over an old dam that supported a grist mill. Whiskey was manufactured in what is now Rock Bridge Memorial State Park. The stream flows directly out of the Devil's Icebox Cave and down through the Rock Bridge. Bright sunshine can be seen at the other end of the dark underside of Rock Bridge. This image was shot near the Shooting Star Bluffs hiking trail in Rock Bridge Memorial State Park. There is a story that what is now Gans Creek was once Little Bonne Femme Creek. A mapper misnamed Gans Creek after noticing the Gans Bridge across the stream. 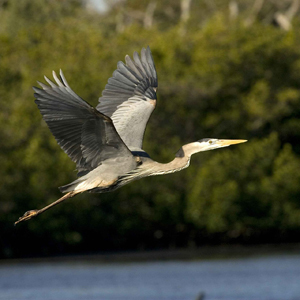 The Gans Creek Wild Area consists of a network of beautiful hiking trails throughout the area. A slight late morning mist can be seen coming off of the Little Bonne Femme Creek, near Easley. The implementation phase of the Bonne Femme watershed Project is starting soon! Please stay tuned for updates to this website as we move forward in the implementation process. The Bonne Femme watershed Plan is complete! It is currently available in electronic format. For more information about the plan, click here. 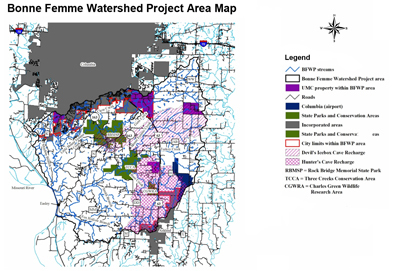 Use watershed planning as a tool to prevent further water resources degradation in order to maintain their long-term quality within the Bonne Femme watershed. Provide cost-share assistance for land owners in the watersheds to implement practices that will protect and restore the streams. 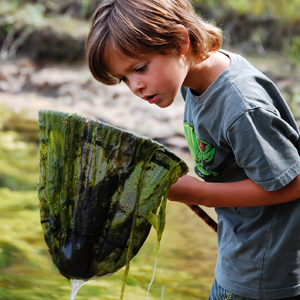 In June of 2003, Boone County was awarded a 4-year grant from the Environmental Protection Agency, through the Missouri Department of Natural Resources. A multi-faceted approach is being taken to address various stream-related issues in the Bonne Femme watershed. For more info, click here.